Too much sugar causes many health problems – watch Dr Robert Lustig on Youtube for more info. Choosing low glycemic sweeteners will help balance your blood sugar levels. Stevia and Lo Han are the best options for anyone on a healing diet with serious sugar concerns – any form of inflammation (any condition ending with an –itis), cancer, candida, infections, viruses. The glycemic index (GI) represents the rate at a which a food is broken down in our digestive systems and released into the blood stream. The more slowly a food is broken down, the lower the glycemic index, and the better that food is for us, as it keeps our blood sugar stable. Foods which are broken down quickly (sugar is one such food) are regarded as less healthy, among other things because they force the pancreas to release lots of insulin all at once in order to transport the glucose extracted from that food from the bloodstream into the cells. In the short term this can lead, among other symptoms, to that well known sugar rush, quickly followed by an energy slump. In the long term, it is likely that this kind of eating over taxes the pancreas and the cells, and may be a factor in weight gain and diabetes. The following sweeteners can be combined for more flavour – eg add a few drops of stevia until you can just get the taste (you don’t want to overdo stevia), then add another sweetener like yacon syrup or Palmyra Jaggery to roundout the sweetness. Stevia and Lo Han can be combined for zero calories and GI. Extract made from the leaves of the Stevia plant. Stevia is a safe, natural alternative that’s ideal if you’re watching your weight, or if you’re maintaining your health by avoiding sugar as it truly has virtually no calories. The liquid is the easiest to use – use it drop by drop as it is hundreds of times sweeter than sugar. Use too much and it has a bitter after taste. The purer the stevia, the less likely it will have an aftertaste. Also comes in flavours such as chocolate, vanilla and English toffee. Powder made from Monk Fruit. No aftertaste. Use sparingly. Keep in an air tight container or it will go hard. Yacon root is from South America. It gets its sweetness mainly from ‘fructooligosaccharides’ (FOS) which cannot be absorbed by the body and which feed the friendly bacteria in our guts. It is therefore seen as a low-calorie sweetener which shouldn’t adversely affect blood sugar. The FOS may also aid the absorption of nutrients from the gut. The syrup is delicious and easy to use. Yacon can also be obtained as a powder but needs to be kept in an air tight container. You can also buy the dried root – this makes a delicious low-calorie snack which tastes like dried apple. This is the dried yellow powder of a Peruvian fruit and tastes absolutely divine – of butterscotch and shortbread. 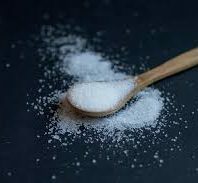 It’s not hugely sweet but using it in a recipe does mean you can use less of other sweeteners and it is low glycaemic. It is also nutrient dense, being especially high in betacarotene, vitamin B3, and iron. Lucuma powder is raw. You would probably need to use another sweetener as well. Xylitol looks and tastes like white sugar. It is produced from natural sources, often birch trees. Good for your teeth as it re mineralizes enamel. Useful in raw desserts such as cheesecake or lemon curd tart as other good sweeteners are often brown and give cream coloured desserts a beige effect. Grind to a powder before adding to a raw dish. You will either love or hate this one! Mesquite comes from the mesquite tree of South America and is a relation of carob. It is lighter in colour and has a more caramelly flavour, though it is quite bitter & has quite a ‘distinctive’ taste. Again, it is not that sweet (less so than lucuma) but adding it to recipes – it works well in smoothies for instance – does mean you can add less actual sweetener to your recipe. Mesquite is raw, nutrient-rich, and research shows that it can help to balance blood sugar. Not sweet enough to use as the only sweetener in a recipe. Naturally rich in a number of key vitamins, minerals and phytonutrients, including potassium, zinc, iron, and vitamins B1, B2, B3 and B6. Grind to a powder before adding to raw dishes. Only 3% fructose. Contains 8.5g of iron (per 100g). It is the only plant-based source of Vitamin B12, rich in B1, B2, B3, B6 vitamins, high in calcium, zinc & magnesium. Grind to a powder before adding to raw dishes.